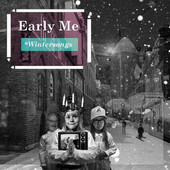 Two official Early Me releases have seen the light: Early Me EP (2011) and Wintersongs (2011). Listen to them below. On every Advent of 2011 I released a new song. The songs pinpoint some winter scenarios in my life, fictive or not; still self-perceived. The first 3 songs are produced by one of Sweden’s most interesting sound artists James Brewster, the songs are performed by him, members of Early Me and our friends: Matti Nilsson, Anna Rudholm and Karin Älverbrandt. The fourth release is a remix of our song Maurice by Magnus Grenstedt (a.k.a Massproducenten). The songs can be used as a sonic backdrop for all the Christmas baking and making. They can also give strength while on the train back to your hometown.